The company had premises at 168 Deansgate, and later at 7 Albert Square. Several of the company's cameras, of different types, are called The British. The British (about 1903 according to McKeown, but Early Photography dates the example shown there to the 1890s, and suggests the camera was made for Chapman by Joshua Billcliff). 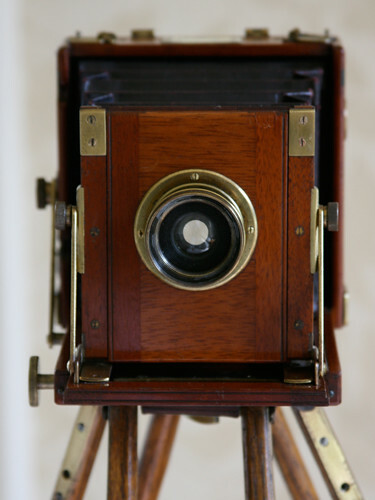 Wood-and-brass folding camera, in quarter, half or full plate size, with double-extension bellows. The British quarter-plate falling-plate detective camera, with a built-in Thornton-Pickard shutter, giving speeds 1/15 to 1/90 second; can be loaded with eighteen plates. Some of these cameras are built according to a patented design by Miller, a company in nearby Salford, and the plaque on the front acknowledges this. Miller made the same camera and sold it as the Adelphi. Two examples have been seen, both with Wray lenses. ↑ 1.0 1.1 Notes on Chapman at Early Photography. ↑ 2.0 2.1 McKeown, James M. and Joan C. McKeown's Price Guide to Antique and Classic Cameras, 12th Edition, 2005-2006. USA, Centennial Photo Service, 2004. ISBN 0-931838-40-1 (hardcover). ISBN 0-931838-41-X (softcover). p200. ↑ 'The British' quarter plate folding camera at Early Photography. ↑ 'The British' folding camera at Wood and Brass. ↑ Half-plate field camera (not identified in the listing as 'The British', but apparently identical) with Lancaster lens; a lot in an auction in November 2005 by [http://www.christies.com Christies in London. ↑ 'The British' (Miller's Patent) quarter-plate detective camera, with 5 inch f/8 Wray Rapid Rectilinear, at Early Photography. In this example, the shutter is mounted in a hinged front board; when closed, this positions the shutter in front of the lens; cf the example cited below. ↑ Example offered for sale at eBay (item 161445198697) October 2014, with a Wray 5-inch f/8 Platystigmat. This example differs from the one at Early Photography: the shutter is permanently mounted on the body, behind the lens. Chapman's plaque on the camera does not acknowledge Miller's patent. ↑ 'The British' stereo camera for 13×18 cm plates, with 5-inch Wray lenses; a lot in an auction in November 2011 by Westlicht Photographica Auction. ↑ Stereo tailboard camera for 4×7 inch plates, with Ross lenses; a lot in an auction in January 1999 by Christies in London. Set of photographs of the British field camera in Hilary Clarke's Flickr photostream. Enlarger sold by Chapman, with Perken, Son & Rayment 'Optimus' lens, at Early Photography. This page was last edited on 9 October 2014, at 11:36.